How does someone become a Renaissance Man or Woman? 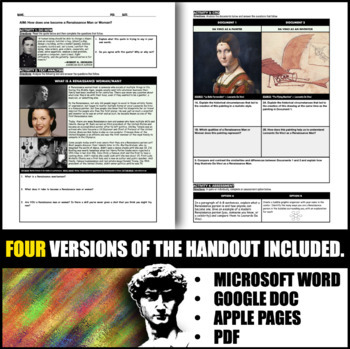 ACTIVITY 1 -- DO NOW: Students will analyze a quote by Leon Batista Alberti and re-write the quote in their own words. Then, they will determine whether or not they agree with it. ACTIVITY 2 -- TEXT ANALYSIS: Students will read about what a 'Renaissance Man/Woman' is. They will learn that in the Middle Ages, people stuck to what they knew, whereas in the Renaissance, people wanted to become jacks of all trades. I use this as an opportunity to teach students that not everyone discovers their skills until later in life. 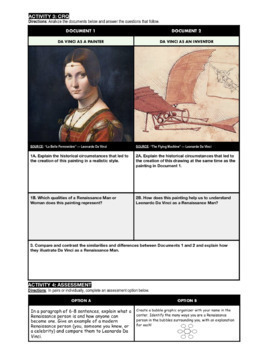 ACTIVITY 3 -- CRQ: Students will analyze a CRQ to compare and contrast the two works by Da Vinci: a painting and an innovative sketch for air travel. 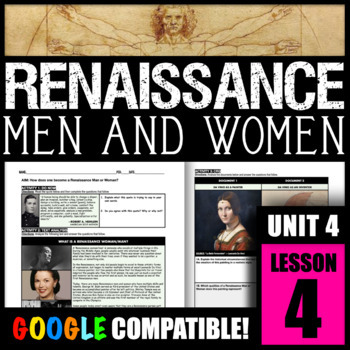 ACTIVITY 4 -- ASSESSMENT: Students will identify one person who is a Renaissance Man or Woman and then a celebrity that they think identifies with the term.